Three artists from The Arc of Anchorage helped make Mountain View a little brighter Wednesday afternoon. 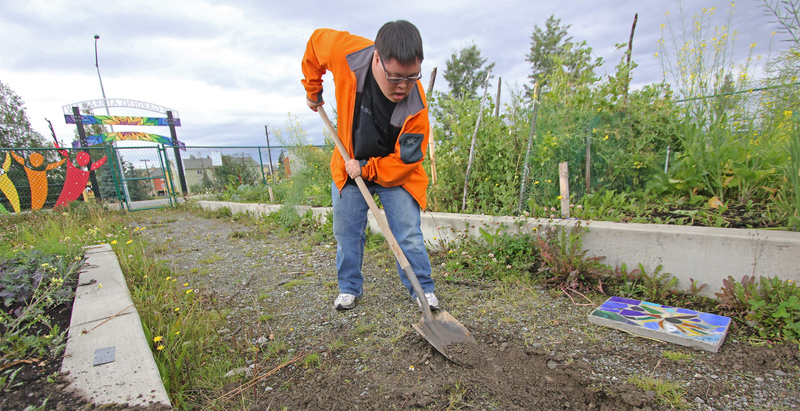 Through a partnership with the Anchorage Community Land Trust, the artists spent the summer creating inlaid ceramic stepping stones for the Gardens at Bragaw — the community garden on Mountain View’s southern edge. The stones are decorated with colorful pieces of glass, shells and imprints, and the artists all received stipends for their work. Funding for the project came from the Rasmuson Foundation and the Alaska Housing Finance Corporation, ACLT said. Wednesday, ACLT staff and Arc teachers helped the artists break ground and lay several of the stones down the garden’s center aisle, where they’re surrounded on either side by lush raised beds overflowing with greenery. According to the land trust, the garden’s 44 individual plots were tended by more than 60 gardeners and fed more than 300 people last year. Thanks for the coverage. The gardens are a true community effort that brings individuals and groups together to learn and share. This is a great example of “the village” at work.